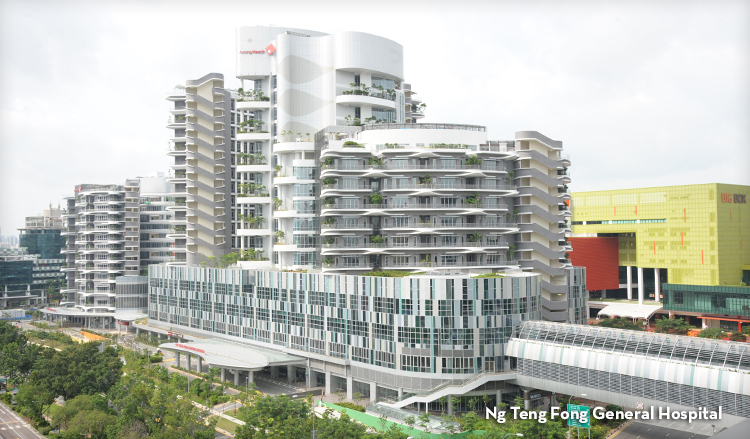 Managed by Jurong Health Services, the 700-bed Ng Teng Fong General Hospital (NTFGH) and 400-bed Jurong Community Hospital (JCH) are the newest hospitals in Singapore's public healthcare. The twinned hospitals are the first in Singapore to be designed and built together from ground up to integrate and transform care processes to better serve the healthcare needs in the west. With the goal of transforming care and bringing health to every home, the integrated hospitals feature several patient-centric features designed for the comfort and convenience of our patients, caregivers and employees. They include the fan-shaped ward with a window for every patient to enhance ventilation, patient comfort and recovery, and provide a better and safer working environment for staff; a pandemic-prepared, trauma-ready and geriatric-friendly Emergency Department for faster response to crises and treatment; a combined Intensive Care (Surgical, Medical, Cardiac) and High-Dependency facility to deliver one standard of care; a 'one queue, one bill and one patient experience' at the Specialist Outpatient Clinics (SOC) to streamline a patient's multiple visits or tests on the same day with one queue number and one bill to save time and money; as well as a satellite pharmacy on almost every clinic floor for ease of collecting medicine. The hospitals are also conveniently linked via J-Walk, an elevated pedestrian network of sheltered link bridges to the Jurong East MRT and bus interchanges, and surrounding business, retail, dining and entertainment facilities. Within the hospitals, a dual-level network of link bridges across all three towers serves to separate patient flow from public pedestrian traffic to ensure infection control and provide greater privacy for patients.